Time spent with family is cherished, and when that time is dedicated to creativity, everyone feels fulfilled. Santa Fe Art Classes is celebrating Mother’s Day with a special painting class on May 8, 2016 from 2-4pm. The special Sunday class allows mothers to spend the special day with those they love, creating memories together. Children five and over are welcome to attend, making it an ideal family event. Mother’s Day is a perfect day to reconnect with family. One of the most popular gifts are flowers, which will be reflected in the subject matter for the painting on this special day. Florals will fill the canvasses of all attendees; each painting completely unique, artistic and individual. “Mother’s day is a perfect time to celebrate your Mom. Indulge her. She deserves it. Spend 2 quality hours with her. I promise she will never, ever forget the gift of your time… and she’ll have your paintings to always remind her...that you arranged this special day for her whole family.” says Robbi Firestone, founder of Santa Fe Art Classes. 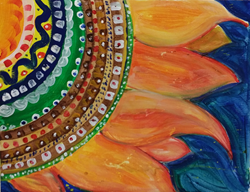 Attendees will each create their own painting during a supportive, joy filled, creative 2-hour, guided painting class. Painters are encouraged to follow their muse and apply their colors, shapes, forms...so every work is profoundly individual.